See our full inventory of cranes available for rent. 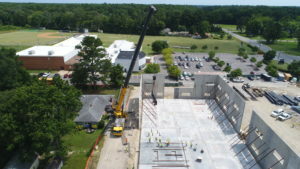 Crofton Crane Rental & Rigging has a well-known reputation of providing and performing high quality work. Our dedicated professional team can assist with all of your lifting needs. From simple lifts to multi crane complex lifts our team has the knowledge and know how to complete the most demanding lifts. We also provide complete engineering and fabrication in house to expedite your project. We service the Commercial, Industrial and Marine lifting needs for our clients. Crofton Crane Rental & Rigging has the equipment, personnel and experience to provide a complete solution to your lifting needs. Our in-house capabilities allow for us to develop, if required, detailed lifting plans as well as critical lifting packages for all your crane service needs. These plans along with years of experience ensure that the job is completed right the first time to the specifications required and with the utmost attention to safety.